Saturday’s football extravaganza saw Tyrone, Westmeath, Donegal, Laois, Kildare and Down join Limerick and Monaghan in the second round of senior football qualifiers. Westmeath boss Tomás O’Flatharta was disappointed his team’s performance in this afternoon’s All-Ireland Senior Football Championship qualifier win against Tipperary. O’Flatharta refused to blame unfamiliar surroundings for a below-par performance, despite a nine-point winning margin in Ardfinnan. Twin terrors Dessie Dolan and Denis Glennon combined for 0-11 of Westmeath’s total, with Glennon the undoubted star turn with 0-5 from play. Dolan was unusually held scoreless from play but the Garrycastle star did pop over six crucial frees for the Lake County, who got their championship campaign back on track following the recent Leinster semi-final defeat against Dublin. Elsewhere, scoring contributions were thin on the ground as wing back Michael-Ennis bombed forward for a first-half score, while half-forwards Simon Quinn and John Smyth contributed a point each. Second half substitute David Glennon, younger brother of Denis, came off the bench with 12 minutes remaining and kicked the game’s final score, three minutes into stoppage time. In many respects, this was a pretty abject performance from Westmeath, but they upped the ante considerably towards the finish to blow away Tipperary, who finished the game with 14 men when corner back Niall Curran was dismissed for a second bookable offence with four minutes remaining. Tipp trailed by just four points, 0-8 to 0-4, with 20 minutes remaining but four unanswered scores followed for Westmeath who moved eight points clear and out of sight with eight minutes remaining. The opening half was fairly uninspiring stuff and 14 minutes elapsed before the game’s opening score arrived, a free popped over by Dolan. Five minutes later Glennon fired over the first of his five points and the Dolan-Glennon one-two struck again in identical fashion to open up a 0-4 to 0-0 advantage ten minutes before half-time. Brian Coen landed Tipperary’s first score of the game, and their solitary first half effort, a 27th-minute free before Smyth, Dolan (free) and the marauding Ennis opened up a 0-7 to 0-1 half-time advantage. Tipp opened with their first point from play, supplied by Barry Grogan, just 16 seconds after the restart and for spells, they dominated around the middle third of the field. Tipp hearts skipped a beat when a Coen free reduced the deficit to four points in the 50th minute but Westmeath stepped on the gas and four unanswered points opened up an eight-point lead. Curran’s frustration boiled over after Glennon fisted his fifth point seven minutes from the end and the Mullinahone clubman, brother of Tipp senior hurler Paul, was dismissed for clashing with the Westmeath ace after he converted the score. Tipperary: P Fitzgerald; N Curran, M Peters, C McDonald; P Codd, R Costigan, C Aylward; E Hanrahan, G Hannigan; D O’Brien, P Austin (0-1), H Coghlan; S Carey, B Coen (0-2f), B Grogan (0-1). Subs: L Coskeran for O’Brien (h/t), B Mulvihill (0-1f) for Carey (46m), S Stapleton for Austin (inj – 62m), T Dalton (0-1) for Coen (62m), M Phelan for Peters (66m). Westmeath: G Connaugthon; F Boyle, K Gavin, J Keane; M Ennis (0-1), D Heavin, D Healy; D O’Donoghue, P Bannon; S Quinn (0-1), J Smyth (0-1), D Harte; D Dolan (0-6f), D Glennon (0-5), D Bannon. Subs: P Tormey for Harte (inj – 45m), G Dolan for P Bannon (55m), David Glennon (0-1) for D Bannon (58m), C Mullen for Connaughton (69m), W Murtagh for Healy (69m). Referee: M Deegan (Laois). A sensational goal in the second minute of injury time by James Kavanagh snatched a one-point victory for Kildare in a pulsating tie in Newbridge. The wing-forward held his nerve well to finish a wonderful move kickstarted by Mick Foley’s barnstorming run and continued by Dermot Earley. It looked like the Lilies had blown it as Cavan hadn’t led between the third and 66th minutes but with Seánie Johnston tormenting Andriú Mac Lochlainn, the Breffni men got themselves back into the game. The tension was palpable early on with referee Cormac Reilly handing out three yellow cards before the throw-in, two to Cavan forwards Johnston and Eddie O’Reilly and one to Kildare defender Mac Lochlainn. The sides were level three times in the opening 10 minutes, after Ronan Flanagan opened the scoring for the visitors, before Pádraig O’Neill equalised almost immediately with the outside of the right boot. A couple of John Doyle scores were responded to by a neat finish from Martin Reilly and a Dermot McCabe free but Kildare completely dominated the remainder of the half thanks to the dominance of the midfield sector. What was significant though was the quality of the delivery into the forward division, where Doyle, O’Neill and Alan Smith were enjoying themselves thoroughly. Smith was fouled for two frees converted by Doyle either side of a fine effort by Eamonn Callaghan and when Ken Donnelly lofted over after a lovely one-two with Smith, it was looking good for Kieran McGeeney’s charges. Johnston stopped the rot with a well-taken score but a couple of more points from play by Doyle and Dermot Earley after another sumptuous move stretched their advantage to six. Cavan did look dangerous when they got the ball into the full-forward line however, and a couple of points in injury time from full-forward Eddie O’Reilly, and a Johnston free left them with some hope at the interval, trailing by just 0-10 to 0-6. Paul Brady’s fisted goal 30 seconds after the resumption played a major part in the fightback, although when Kildare responded with four points in succession, it looked like the hosts had things under control. That was to reckon without Johnston and veteran Dermot McCabe however, and when the former pointed with just two minutes remaining to push Cavan two points clear, an unlikely victory seemed secured. That was until Kavanagh’s dramatic intervention. Kildare: E Murphy; M O’Flaherty, D Hendy, A Mac Lochlainn; E Bolton 0-1, M Foley, K O’Neill; K Brennan, D Earley 0-1; J Kavanagh 1-0, P O’Neill 0-1, E Callaghan 0-1; A Smyth 0-2, K Donnelly 0-2, J Doyle 0-8(4fs). Subs: M Scanlon for Hendy (61); P Mullarkey for P O’Neill (67); M Conway for Smith (67). 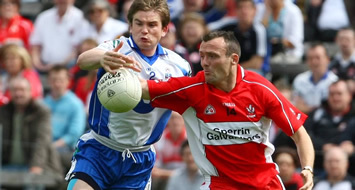 Cavan: J Reilly; M Cahill, M Hannon, D Sheridan; A Forde, M McKeever, B Watters; E Keating, D McCabe 0-4(fs); P Brady 1-0, R Flanagan 0-1, M Reilly 0-1; S Johnston 0-6(3fs), E O’Reilly 0-2, C Mackey 0-1. Subs: P O’Reilly for Reilly (39); N Walsh for Keating (45). Tyrone scored a comfortable win over Louth in Drogheda to toss their name into the hat for Sunday’s second round SFC Qualifier draw. The Red Hands survived a tricky Qualifier test to move a step closer to a return to mainstream championship football. And in the process they offered suggestions that they could yet be a force this summer. Tyrone blossomed after a sluggish opening, hitting points through Martin Penrose, Tommy McGuigan and Sean Cavanagh to open up a three points lead. But Louth drew level in the 18th minute with their only score of the first half, a Darren Clarke goal. Paddy Keenan delivered long for Mark Stanfield to gather and slip a pass inside for Clarke to finish from close range. That was the trigger for the Red Hands to cut loose with an exhibition of flowing football. 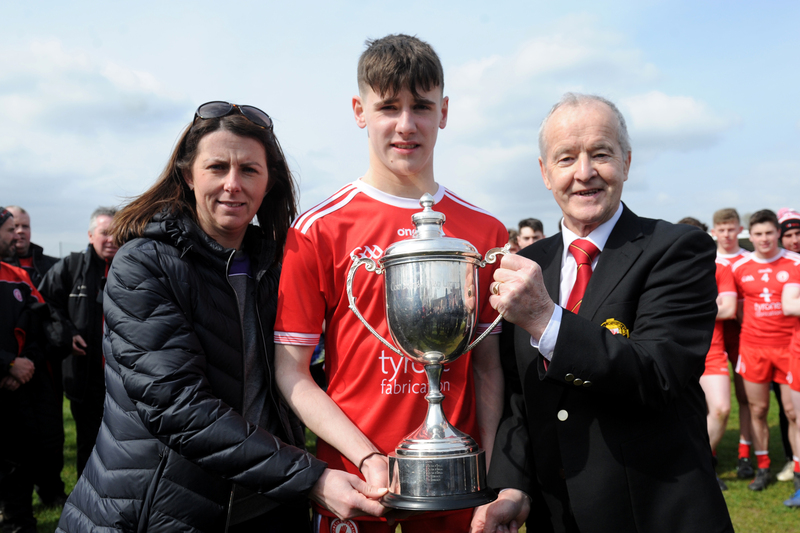 With Brian Dooher getting through an immense amount of work and Brian McGuigan an increasingly creative influence, they cut swathes through a hard-pressed Louth defence. The points flowed, and by the 25th minute, all six forwards had scored from play, with Colm McCullagh, Brian McGuigan, and Dooher hitting the target. And they got in for a goal on the half-hour, midfielder Enda McGinley finding the net. Martin Penrose picked out McGuigan with a superb crossfield pass, and he timed his assist perfectly for McGinley to take at pace and finish low to the net. There were further scores from Philip Jordan, McCullagh and Cavanagh for a commanding 1-10 to 1-0 interval lead. And the gap could have been greater had Tyrone taken even one of three other goal chances they created, with Mick Fanning, Keenan and goalkeeper Stuart Reynolds all coming to their side’s rescue. Louth started the second half with a flourish, Aaron Hoey thumping over a 55 metre free and substitute Brian White getting their first point from play. But playmaker McGuigan took a delightful pass from younger brother Tommy to shoot his third point of the contest and settle Red Hand nerves after Clarke had reduced the deficit to seven. Tommy McGuigan raced through for what would have been a quite special individual goal, had he not dragged his shot just wide at the far post, and another goal chance saw Penrose miss the target. Tyrone continued to press, and scores from Moy club colleagues Cavanagh and Ryan Mellon added to the mounting tally, with McCullagh bringing his count to five. Louth were awarded a penalty for a foot block by Philip Jordan, but Shane Lennon blazed his kick over the bar, and that was the end of their challenge. It was a competent if unspectacular second half display by the Red Hands, who took their collective foot off the pedal in the second half, but still managed to win with something to spare. 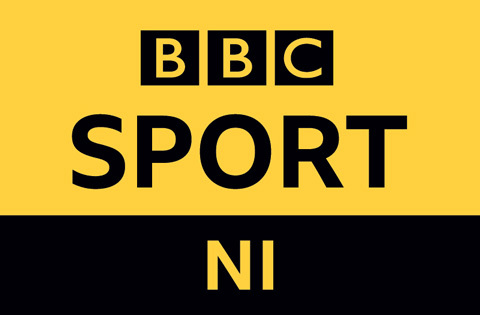 Now they’ll want a greater challenge when the draw for the second round of the Qualifiers is made this evening, with the games to be played next Saturday. Louth: S Reynolds, J Neary, M Fanning, J Carr, B McArdle, D Finnegan, R Finnegan, P Keenan, R Carroll, A Reid, A Hoey (0-1, f), D Reid, M Stanfield, S Lennon (0-3, 1 pen), D Clarke (1-3, 1f). 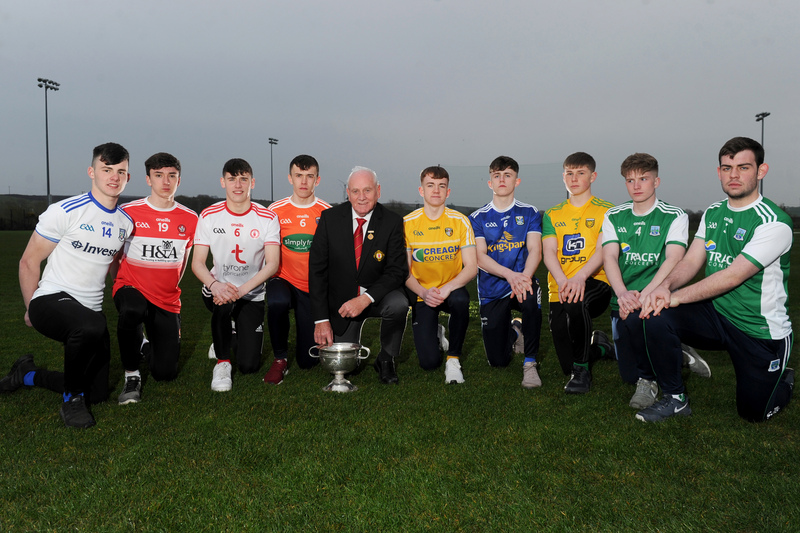 Tyrone: J Devine, R McMenamin, J McMahon, PJ Quinn, D Harte, C Gormley, P Jordan (0-1), R Mellon (0-1), E McGinley (1-1), B Dooher (0-1), B McGuigan (0-3), T McGuigan (0-1), M Penrose (0-1), S Cavanagh (0-4), C McCullagh (0-5, 1f). 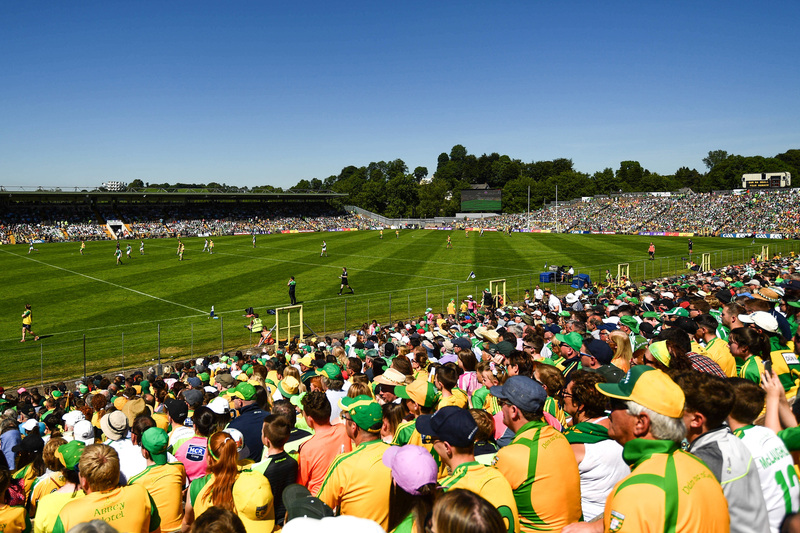 A crowd of around 6,000 witnessed a rip-roaring first half which saw Donegal soar ahead by two goals inside eight minutes. The use of the high ball into the Roscommon goal area was causing problems and Michael Murphy availed of a Colm McFadden flick to drive home the first on four minutes. When debutant Stephen Griffin got on the end of another high delivery from Michael Murphy four minutes later to finish the second, it looked like a walk in the park for the home side. But Roscommon failed to read the script and thanks to a fortunate penalty award on 17 minutes, they were back in the contest. Full-forward Senan Kilbride was the player deemed to be fouled and Karol Mannion found the back of the net with some style. By half-time Roscommon were back within two points thanks to two frees from Gerard Henaghan and one from Kilbride, although the latter was bizarrely withdrawn from the action minutes from the break even though he seemed to be causing trouble for the Donegal defence. The Roscommon challenge was dealt a body blow five minutes from the break when their best player of the half, corner-forward Cathal Cregg received a straight red card after he got involved in a scuffle with Eamon McGee. It got worse early in the second half when they were reduced to 13, losing Jonathon Gunning to a straight red while Donegal lost Neil McGee to a second yellow after the pair clashed off the ball. There were three points between the teams when Donegal got their third goal from the penalty spot. Stephen Griffin was the player fouled and Michael Murphy found the corner to end the game as a contest. Donegal pulled away in the closing quarter with some great points from Colm McFadden as Roscommon’s challenge disintegrated.The Connacht men could only manage five second half points, three ofthem frees from Henaghan, and they never looked like getting the goal needed to bring them back into the contest. Donegal will meet stiffer challenges in the weeks ahead but they will take positives from the game, not least the fact that they created some six goal scoring chances. Young Michael Murphy and Colm McFadden were both denied goals in the second half while Roscommon corner-back Paddy O’Connor produced a great block to deny McFadden early in the first half. Donegal: P Durcan; E McGee, N McGee, K Lacey; F McGlynn, B Monaghan, K Cassidy; N Gallagher, R Kavanagh (0-1); K Rafferty(0-1), D Walsh (0-1), S Griffin (1-0); C McFadden (0-5m3f,45), R Bradley, M Murphy (2-2,pen,2f). Subs: S McGowan for Monaghan; B Devenney for Bradley; C Toye (0-1) for Walsh; M McGowan for McGlynn; C Dunne for Walsh. Gregg, S Kilbride, G Heneghan. Subs: J Dunning for Kilbride; S O’Neill (0-1) for Finneran; A McDermott for Keenan; C Devaney for Rogers. Down and Offaly will both be operating in Division Three of next year’s NFL, but Down were in a different league in the first round of the GAA football championship qualifiers in O’Connor Park on Saturday. A sizeable contingent of Down supporters travelled to Tullamore and on a warm and sunny evening they were treated to a feast of scores and a good all round performance from the men in red and black. Slow starts had been a feature of Down championship performances so far this year and the visitors wasted no time in setting that statistic to rights, hitting 1-4 in the first eight minutes to burn off the challenge of Offaly from the very start. Daniel Hughes raised the green flag after good interplay with Benny Coulter left him one on one with the keeper, his low shot evading Padraic Kelly. Offaly got their first point after thirteen minutes when Paschal Kelleghan finished well from out on the left wing. However, Down continued to add to their lead with a steady flow of very well taken points, usually through Coulter showing well and laying off to his fellow attackers. Ronan Murtagh and John Clarke were the main beneficiaries of Coulter’s vision and Clarke got Down’s second goal when he volleyed home a Hughes handpass after the Mayobridge man had yet again carved open the Offaly defence with only a few minutes left to half-time. Offaly were then rocked with a second goal inside a minute when Coulter this time laid the ball off to Kevin McKernan and the centre forward hit the corner of the net with another well-placed finish. By the start of the second half, Offaly had made four substitutions and the home county were making a renewed effort to salvage some pride, But Down always had plenty in hand and continued to chip away with points into the breeze. Two goals from Paschal Kelleghan gave the home supporters something to cheer about, but sloppy defensive play at the other end allowed Murtagh and substitute Ronan Sexton to score tap in goals for Down to round off a successful evening for Ross Carr’s men. Offaly: P Kelly; G Rafferty, S Brady, P McConway; Kl Slattery, Js Keane, N Grennan; C McManus (0-1, free), N Smith; N Darby, J Coughlan, J Kelly; Kelleghan (2-1), J Reynolds (0-2), N McNamee (0-4, 0-2 frees). Subs: A McNamee for N Darby, B Darby for Rafferty, G Comerford (0-2) for Coughlan, D Egan for Kelly, S Ryan for Reynolds. Down: B McVeigh; M Cole, C Murney, L Howard; P Murphy, A Carr (0-4, 0-3 frees), K McGuigan; D Gordon (0-2), A Rodgers (0-1); J Fegan, K McKernan (1-1), D Hughes (1-1); J Clarke (1-4), R Murtagh (1-5, 0-1 free), B Coulter (0-1). Subs: G McArdle for Murphy, P Turley for Cole, D McCartan for Murney, J Lynch for Howard, R Sexton (1-0) for ROdgers (Blood). A 55th minute Donal Kingston goal was the catalyst for victory as 14-man Laois booked a spot in the second round of the All-Ireland Football Qualifiers, following a two-point win over Longford at Pearse Park. Although Longford dominated possession in the opening half, Laois weren’t keen to let them capitalise on this dominance, with the likes of Darren Rooney and Tom Kelly forming a centre partnership down the middle in defence. Both teams failed to find their swagger in the first half as Longford kicked six wides in the opening 35 minutes, and they were very lucky to be just one point adrift at the interval, with Laois more clinical in front of the posts. Kelly’s 16th minute point came following a good move involving Kingston and Brian McCormack as Laois went 0-3 to 0-2 clear at the end of the opening quarter. A Kavanagh point tied things up for the third time 12 minutes from the interval, but with Longford also miss-firing heavily, it was still anyone’s game, Laois leading by 0-5 to 0-4 at the break, following a third point from the boot of Tierney. Laois engineered a strong start to the second half and following a defensive lapse by Longford centre-half-back Arthur O’Connor, Ross Munnelly capitalised for the first score after the restart opening up a two-point lead for the first time in this game. It took Longford ten minutes to score their first point of the second half, with Paddy Dowd on target and following quick scores from McGee and Kavanagh, Longford crept into a 0-7 to 0-6 lead by the 49th minute. A Paul Barden score helped open up a two-point gap, but Laois were far from finished with Kingston’s goal paving the way to victory, The Barrowhouse player scored 1-2 in the final quarter to secure the win. Longford continued to pile on the pressure and although Kavanagh misfired from a free, Paul Barden sent the home crowd into raptures when his point, opening up a two-point lead as the game entered the final quarter. But Laois weren’t finished yet, as 50th minute substitute Billy Sheehan, fed Kingston for Laois’s goal which saw the O’Moore’s into a one-point lead with 15 minutes remaining, ultimately proving to be the match-winning score. Laois: D Kingston (1f) 1-3; MJ Tierney (3f) 0-3; T Kelly, B Quigley, R Munnelly, B Brennan 0-1 each. Longford: F McGee (1f) 0-4; B Kavanagh (2f) 0-3; P Barden, P Dowd 0-2 each. Laois: M Nolan; C Healy, D Rooney, C Ryan; P O’Leary, T Kelly, P McMahon; B Quigley, J O’Loughlin; R Munnelly, B Brennan, B McCormack; MJ Tierney, C Parkinson, D Kingston. Subs: C Kelly (St. Joseph’s) for Parkinson (BS 26-29); B Sheehan for Munnelly (50); C Kelly (St. Joseph’s) for Tierney (58); P Lawlor for Parkinson (66); D Murphy for O’Leary (69). Longford: D Sheridan; D Brady, N Farrell, C Conefrey; S Mulligan, A O’Connor, D C O’Reilly; L Keenan, P Dowd; D Farrell, P Barden, D Masterson; F McGee, P Berry, B Kavanagh. 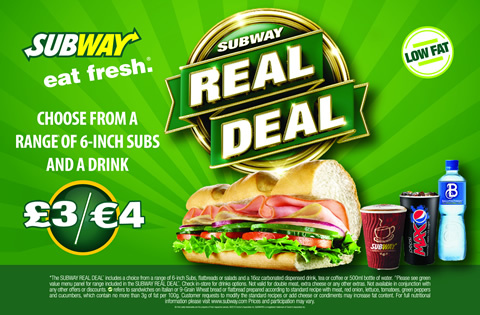 Subs: K Mulligan for D Farrell (46); P Foy for Berry (64).